Production: RKO/Radio Pictures; black and white, 35mm; running time: 115 minutes. Released 1941. Producer: Samuel Goldwyn; screenplay: Lillian Hellman; additional scenes and dialogue: Dorothy Parker, Alan Campbell, and Arthur Kober, from the play by Lillian Hellman; photography: Gregg Toland; editor: Daniel Mandell; production designer: Stephen Goosson; music: Meredith Wilson. Cast: Bette Davis ( Regina Giddens ); Herbert Marshall ( Horace Giddens ); Teresa Wright ( Alexandra Giddens ); Richard Carlson ( David Hewitt ); Charles Dingle ( Ben Hubbard ); Carl Benton Reid ( Oscar Hubbard ); Dan Duryea ( Leo Hubbard ); Patricia Collinge ( Birdie Hubbard ). Noble, Peter, Bette Davis: A Biography , London, 1948. Griffith, Richard, Samuel Goldwyn: The Producer and His Films , New York, 1956. Reisz, Karel, William Wyler: An Index , London, 1958. Davis, Bette, The Lonely Life , New York, 1962. Ringgold, Gene, The Films of Bette Davis , New York, 1965. Bazin, André, What Is Cinema , Berkeley, 1971. Madsen, Axel, William Wyler , New York, 1973. Vermilye, Jerry, Bette Davis , New York, 1973. Kolodiazhnaia, V., William Wyler , Moscow, 1975. Marill, Alvin R., Samuel Goldwyn Presents , South Brunswick, New Jersey, 1976. Tuska, Jon, editor, Close-Up: The Hollywood Director , Metuchen, New Jersey, 1978. Anderegg, Michael A., William Wyler , Boston, 1979. Epstein, Lawrence J., Samuel Goldwyn , Boston, 1981. Higham, Charles, Bette: A Biography of Bette Davis , New York, 1981. Robinson, Jeffrey, Bette Davis: Her Film and Stage Career , London, 1982. Kern, Sharon, William Wyler: A Guide to References and Resources , Boston, 1984. Champion, Isabelle, Bette Davis , Paris, 1986. Walker, Alexander, Bette Davis: A Celebration , London, 1986. Davis, Bette, with Michael Herskowitz, This 'n' That , New York, 1987. Bowman, Barbara, Master Space: Film Images of Capra, Lubitsch, Sternberg, & Wyler , Westport, 1992. Jacobsen, Wolfgang, and Helga Belach, and Norbert Grob, William Wyler , Berlin, 1996. Herman, Jan, A Talent for Trouble: The Life of Hollywood's Most Acclaimed Director, William Wyler , New York, 1997. Times (London), 19 January 1941. Spectator (London), 23 January 1941. Variety (New York), 13 August 1941. New York Times , 22 August 1941. Monthly Film Bulletin (London), November 1941. Isaacs, Hermine Rich, "William Wyler: Director with a Passion and a Craft," in Theatre Arts (New York), February 1947. Koenig, Lester, "Gregg Toland, Film-Maker," in Screen Writer (London), December 1947. Slocombe, Douglas, "The Work of Gregg Toland," in Sequence (London), Summer 1949. Griffith, Richard, "Wyler, Wellman, and Huston," in Films In Review (New York), February 1950. Reisz, Karel, "The Later Films of William Wyler," in Sequence (London), no. 13, 1951. Quirk, Lawrence J., "Bette Davis," in Films in Review (New York), December 1955. Mitchell, George, "A Great Cameraman," in Films in Review (New York), December 1956. Reid, John Howard, "A Little Larger Than Life," in Films and Filming (London), February and March 1960. Hanson, Curtis Lee, "William Wyler," in Cinema (Beverly Hills), Summer 1967. Doeckel, Ken, "William Wyler," in Films in Review (New York), October 1971. Higham, Charles, "William Wyler," in Action (Los Angeles), September-October 1973. American Film (Washington, D.C.), April 1976. Von Cottom, J., "Les Immortels du cinéma: William Wyler," in Ciné Revue (Brussels), 30 August 1979. Karnes, Cheryl, in Magill's Survey of Cinema 2 , Englewood Cliffs, New Jersey, 1980. Lillian Hellman's play, a prime example of the "well-made" variety, is precisely the kind of successful middle-brow property that appealed to Samuel Goldwyn. He had already produced Hellman's controversial The Children's Hour (also directed by William Wyler, with cinematographer Gregg Toland), a play that handsomely survived a title change to These Three and the transformation of the issue of lesbianism into an illicit heterosexual affair. No major alterations were required for The Little Foxes . The film even resists the conventional "opening up" so often applied to theatrical texts, in the mistaken notion that fundamental cinematic values are expansively pictorial ones. Wyler's directing energies are deployed in the concentrated focus that suits the closed-in nature of this fiction. He exploits the closure of a house, its rooms and furniture to convey the power struggles of ambitious siblings, a rotten marriage, and the coming-of-age of the daughter, in the turn-of-the-century South. The family is the scene of an action whose violence (and theatricality) is augmented by the tightness of the area in which it is enacted. The various postures of Regina Giddens provide the fulcrum for the shots of which she is the center, and of the family configuration that she dominates. She exercises her intelligence and her desire in the manipulation of the figures around her, plotting and placing them with an expertise and a tyranny that is matched by the director himself. The expertise was recognized by André Bazin in his essay on Wyler included in the French edition of What Is Cinema? Bazin analyzes the properties of hard and soft focus in the scene where Regina refuses to give her husband his medicine, while he is in the throes of a heart attack. She remains rooted in her divan during his struggle from the foreground to the background of the frame. Here, the famous Wyler-Toland deep-field staging eschews hard focus on the background. Horace's death on the staircase is a function of the hard focus on Regina's face and torso. 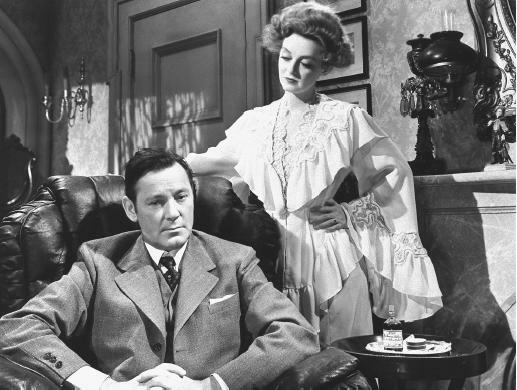 This sort of strategy is what constitutes the cinematic in The Little Foxes , a film that requires great attention in order to be read in its fullness. The explicit dramaturgy is contained, of course, in the dialogue and plot. But this bourgeois drama truly challenges us in the nuances of its staging, in what must be seen rather than said about family relationships—the slight camera pan on a group of four characters as Aunt Birdie confesses her drinking, the duplicitous play of the faces of the father and son in a shaving mirror, the low camera placement that captures Regina's swaying progress up her lonely staircase. The care of the staging and the long shot durations are what make Wyler an actor's director, and no more so than in this ensemble film, where the strength of the company enhances and is enhanced by the star performance of Bette Davis. To the actress's regret, this was her last collaboration with Wyler, the director of her great successes, Jezebel and The Letter .